I’ve been a chocolate fiend for as long as I can remember. My obsession started with Snickers, then digressed to Caramelos (oy! ), made a right turn at peanut butter cups, and has finally arrived at the basics – good old dark chocolate. I enjoy dark chocolate most evenings and love trying new vegan brands. But I’d been wanting to make my own for a while now, especially since procuring cocoa butter for these glorious cheesecakes. Plus, I knew I could make it refined-sugar free and load it up with my favorite toppings. Verdict: So good. So easy. At this point I’m basically operating a chocolate factory out of my apartment. That’s really all you need for a good base, at which point you can add vanilla extract to enhance the flavor, sea salt bring out the sweetness, and roasted almonds (or other toppings) for extra crunch. The threshold to make chocolate at home is super low as well! You don’t need fancy molds, thermometers, or equipment; just a whisk, a bowl, and a baking sheet. This chocolate makes an excellent healthier dessert, and would be especially ideal for entertaining. When your friends find out you know how to make your own chocolate, they’ll never leave your house. If you give this recipe a try, let us know how it goes! Leave a comment below and rate it – it’s super helpful for us and other readers. And don’t forget to tag a picture #minimalistbaker on Instagram. We’d love to see what you come up with. Cheers! 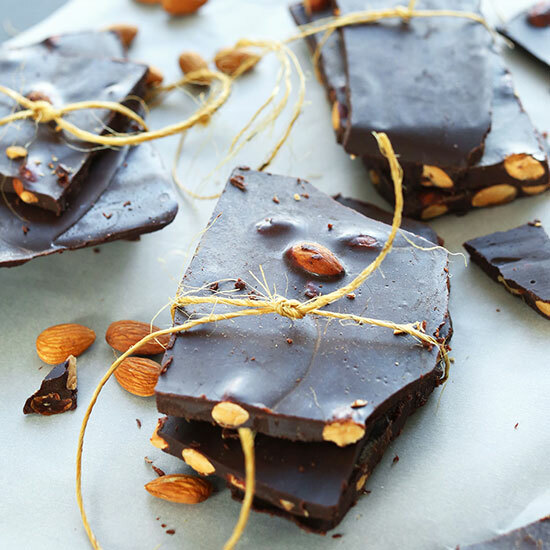 Easy, 6-ingredient dark chocolate bars made from scratch and topped with toasted almonds and sea salt. Refined sugar free, vegan and gluten-free, and seriously satisfying. Once melted, remove from heat and add maple syrup and whisk to combine. When the mixture is completely fluid with no separation, add cacao or cocoa powder and vanilla extract. Whisk to thoroughly combine. Taste and adjust sweetness if needed - I found 1/3 cup to be perfect (amount as original recipe is written // adjust if altering batch size). Pour the chocolate into candy molds (if you have them), mini paper cupcake liners, or simply line a baking sheet with parchment paper and pour the chocolate on top. Top with roasted almonds and sprinkle of salt. Set in the refrigerator or freezer to harden for 30 minutes to 1 hour. Once completely solid, break or cut into pieces/bars. These can be kept at room temperature for serving. But for best freshness, store chocolate in an airtight container or freezer bag in the refrigerator for 2-3 weeks, or the freezer for 1-2 months. *If you can't find cocoa butter, you can try to sub coconut oil (1 cup (240 ml) coconut oil per 1 cup (218) g cocoa butter). However, I did find it to make the texture and mouth feel more oily and a couple of readers have suggested it doesn't mix as well with the maple syrup. In this way, I highly recommend using cocoa butter. *If your almonds are raw, roast on a baking sheet at 350 degrees F (176 C) for 8-12 minutes, or until fragrant and slightly golden brown. *The link above to the cocoa butter is an amazon link that gives us a small commission if you choose to make a purchase. Great recipe. It was very easy to follow and it came out great. I used 1/3 cup of maple syrup. Thanks! I see your recipe calls for COCOA butter. Will there be a noticeable difference in the end product if I use CACAO butter instead? Another reader used half coconut oil and half cacao butter and had success, so let us know how you make out if you try using just cacao butter. We haven’t tried it and can’t say for sure how it would go. I used Cacao butter and Cacao powder.. worked perfectly. Thank you for this post. I have been doing keto since Thanksgiving, and find that $4 for a sugar free/Maltitol free candy bar is a little steep for my budget! I used this recipe as a guide and substituted Vitafiber syrup for the maple syrup with great success. I also added 1/2 t. of stevia glycerite to increase the sweetness. Half a recipe made 3 candy bars, each netting approximately 8g of carbs. This is a game changer! Happy New Year! Can this be made with a few drops of Stevia instead of maple syrup? Will it be too thick? Hi! We haven’t tried using stevia and can’t say for sure how it would turn out here.. if you experiment with the recipe, let us know how it goes! I made them exactly as your recipe instructed and it’s the best chocolate I’ve ever made!! Thank you so much!! Can I use cacao nibs in this recipe in place of cacao powder? I’m excited to make this, thanks for posting!!! I actually tried that and found it VERY difficult to grind them into a fine enough powder. I wouldn’t recommend it! Hi, I’ve been using this recipe and it’s awesome btw…. quick question as I normally leave these treats in a jar in the fridge but if leave these out at room temp they are incredibly soft and basically start melting the moment your fingers tough, is this intended or does this require a tempering? It doesn’t require tempering and can be kept at room temperature for serving. But for best freshness, store chocolate in an airtight container or freezer bag in the refrigerator for 2-3 weeks, or the freezer for 1-2 months. This recipe is a lifesaver for us. We both love chocolate and can rarely find a healthy version in the store. This is so simple to make and even more enjoyable than any boughten chocolate. I have put hempseed, raw pumpkinseed and organic craisins, almonds and raisins on top at times and all are satisfying and healthy. Thanks for sharing this awesome recipe!!! I saw that someone asked this above, but it wasn’t answered.. I’m about to find out the hard way.. is the cocoa butter measured melted or in chunks? Thanks! It’s measured BEFORE melting, so it’s measured in chunks. Thank you for your response and the method to calculate but Im not sure I understand the last step of your calculations? Using the original recipe this is how the calculations work out according to your response. So my questions, where do you get the 70-75%? I just want to understand the method of calculation because I weigh all my ingredients when making this recipe. After making this recipe several times, I have adjusted some of the measurements to my personal liking and wanted to know how to calculate the cacao % based on my own weighted measurements. Ha! You’re way better at math than us ;D Your calculation appears more accurate. Just based on the equation I did a rough estimate, but yours seems more on point. By chance would you know how to calculate the cacao percentage for this recipe? I make this chocolate all the time and everybody loves it but everybody always asking me if I know the cacao %. My friends and family know the the higher cacao percentage the better the health benefits. cacao butter 104g, cocoa powder 48g, Maple Syrup 100g and 1/2 tsp vanilla. Is there anyway you could help me figure out the cacao percentage? Thank you so much, I would like to stay around 60% cacao or higher, if I can and will adjust the sugars accordingly but wasn’t sure how to figure that out. Hmm, we weren’t sure on that. But it seems some experts suggest you divide the serving size in grams by the grams of sugar in that serving, and that gives you the rough cacao content. So with one serving of this bar being about 37 grams with 5 grams of sugar (calculated with 80 ml maple syrup), that would mean it’s about 70-75% cacao. Hope that helps! Does this chocolate melt at room temperature? Does it need to stay refrigerated until use? These can be kept at room temperature for serving. But for best freshness, store chocolate in an airtight container or freezer bag in the refrigerator for 2-3 weeks, or the freezer for 1-2 months. This recipe is awesome, (I did it without the almonds), but when I freeze it the agave or raw honey (I’ve tried both) separate. So I’ll get normal pieces of chocolate and then syrup stuck in the center that had ruined some of the chocolate. Can you tell me what I’m doing wrong? Thanks! I like where your heads at Mafalda ;) We’ll add them to the suggestion list! I made this last night using all ingredients including broken pretzels instead of almonds, refrigerated overnight and it came out a tootsieroll consistsncy. Tasted great tho. Can Normal butter be used instead of coconut oil or Cocoa butter? Please clarify. Oh sweet Mother of Mercy. Six months on a SIBO diet and decided to see what would happen with a bit of chocolate. Cacao butter, maple syrup, unprocessed cocoa powder with some black cocoa to make up the weight and just a pinch of espresso powder. I totally forgot to add the vanilla but I did wait for it to get to 92 deg before pouring it over some toasted macadamia nuts. Oh my goodness gracious me. My face broke out, it never does that. You know what? Totally worth it! I know what I’ll be fixing myself this Christmas with the 4 lbs of cacao butter just ordered. I tried your recipe, substituting honey for the maple syrup and placed it on a baking sheet like you suggested but after refrigerating for 1 hour the chocolate never got hard enough to break into pieces. I tried putting it into the freezer but still no success. The taste of the chocolate is good but the texture is wrong. Soft and bendable but hard enough to break into pieces. What do you suggest? I love this recipe! I changed it up a bit and used Trader Joe’s freeze dried rasbpberies and blueberries instead of roasted almonds to give it a bit of a crunch. I also used agave instead of maple syrup and the texture was fine. I can’t believe how easy it was to make chocolate. Thank you! 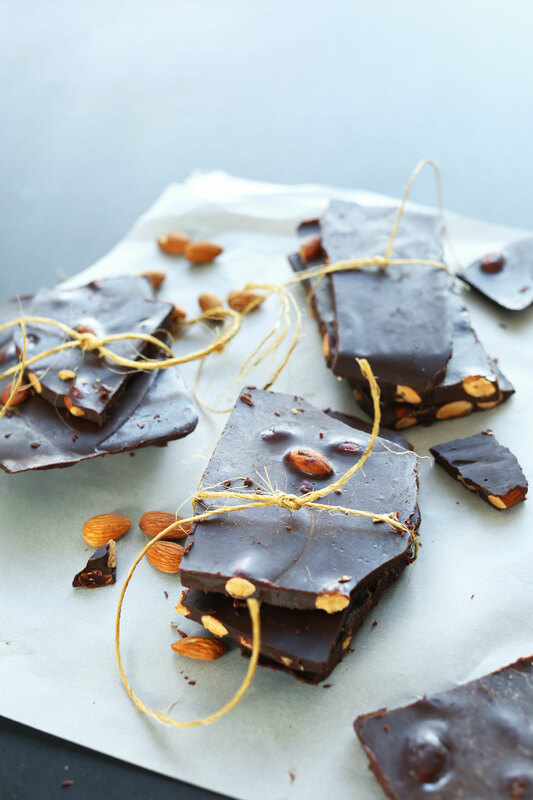 I was so looking forward to making the dark chocolate bark…I followed the recipe to the letter and it didn’t turn out….soooo disappointed. When I added the cocoa powder to the liquified cocoa butter and maple syrup it turned into a hard mass….nothing would make it liquid enough to pour. The recipe worked perfectly! The only question I have is that the chocolate was a little slick. It set perfectly but it was just a little oily. Did I use to much cocoa butter? made this and it was scrumptious. i will be making it again very soon. thank you for the creative recipe! Hi! I made this the other night and it was delicious so I ate quite a few chunks of it. Maybe a little less than a quarter of the recipe. I’m guessing it was because I used raw cacao powder which I’ve never consumed that large an amount of in one sitting, and I got really really jittery and had a headache and trouble sleeping…all of these symptoms lasted for the next ~ 24 hours then went away. My husband had far less than I did and didn’t experience this. My mom and I are pretty sensitive to caffeine so I figure it’s the cacao since it’s a stimulant — just curious, has any one else experienced this baking with raw cacao? Does it happen if you use processed cocoa, and does it still taste as good with regular cocoa? I want to try again with processed cocoa because this recipe was soo delicious and tasted way healthier than store bought dark chocolate, but I don’t want to suffer the unpleasant reactions to the cacao again! (I am assuming that’s what it was after googling and it seems other people have a similar reaction to cacao?) Thanks! Can’t wait to try this! 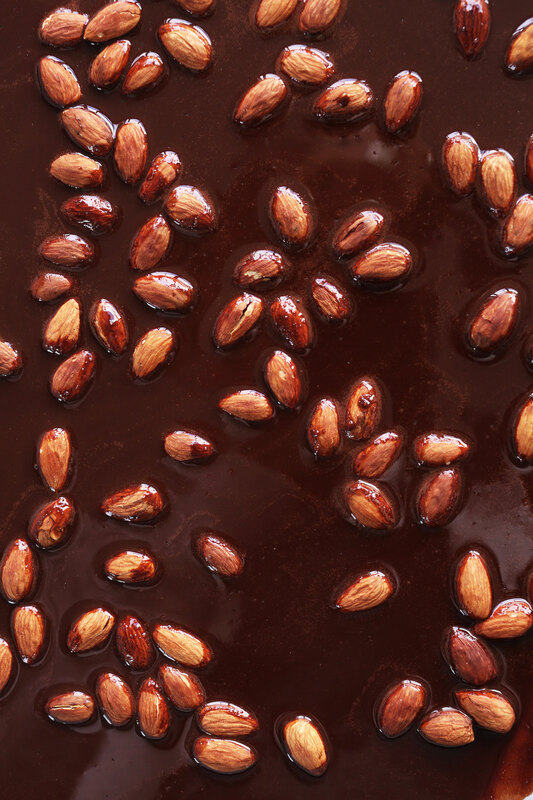 The almonds will make the dark chocolate good. But I was wondering, could you do this with cashew or any whole nut milk to make milk chocolate bars? Or would that mess up the recipe/in the oven? I don’t personally care much for dark choc and am curious about this before I find out myself lol. I tried making the chocolate bars with your suggested recipie of cocoa butter , maple syrup and cocoa powder…. but the txture of tbe bars turned out like a chocolate fudge… don’t know what went wrong ? Hi Aparna, I would suggest freezing it until it’s solid all the way through! I used vanilla and sea salt but instead of roasted almonds I used shredded coconut….and omg! Amazing. My partner says its some of the best chocolate he’s ever had…and in comparison to normal chocolate its healthy too! We don’t have huge sweet teeth so I only used a little less than 1/3 and it still came out fine! This recipe is flawed. One container of the cocoa butter is 500g. It contains about 8-10 cups. So, it is not possible to have one cup weigh 218g. Tried it by weight measurements, but still not a good consistency. Mycryo isn’t better for savory cooking. Thank you for that, looks delicious …..any ideas on how to make the individual chocolate covered almonds ? those are my favorite mid afternoon office snack ! Yeah! 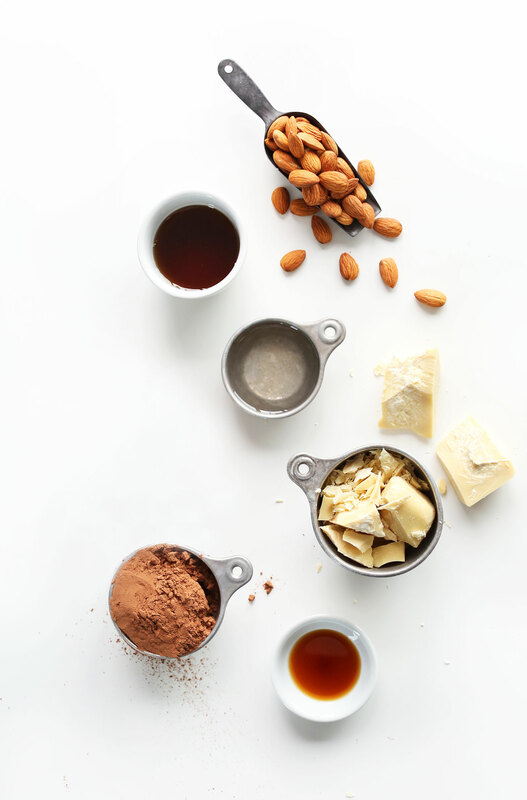 Just add the roasted or raw almonds to a bowl and pour over the chocolate. 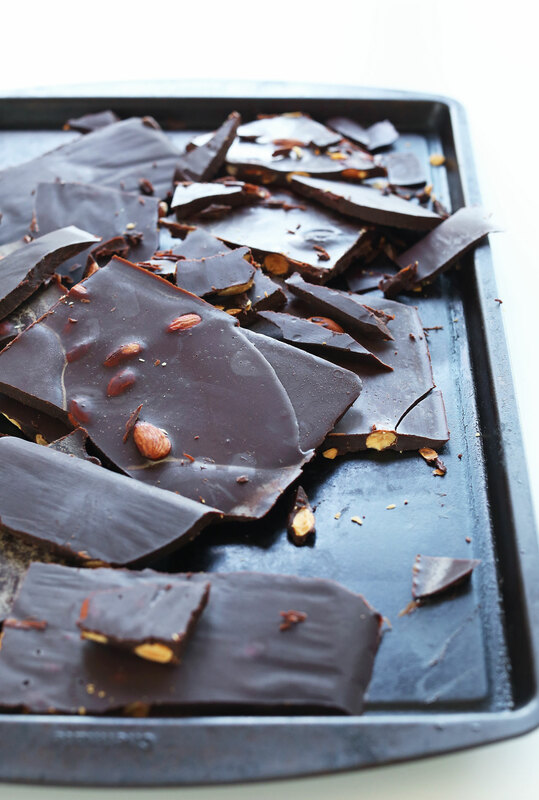 Toss to coat, then lift with a fork to remove excess chocolate and let set on a parchment-lined baking sheet! How about using coconut butter instead of oil? I have had great luck with coconut oil. I do not heat it at all. I just use the back of a spoon and keep stirring the coconut oil and cocoa powder until it’s creamy. (and I use unfiltered/unprocessed honey instead of maple syrup). I’ve added pure vanilla, orange juice & zest, berries, nuts, raisins and organic peanut butter or almond butter. The possiblities are endless! It keeps best in the freezer. Hope this helps. Should have said cacao powder. Help please!! I used brown sugar and melted it with the cocoa butter first (the sugar wasn’t completely melted ) then added the cocoa powder. Once I added the cocoa powder it started to bubble and gather like tiny crystals/nods that never melt!! I even put it in the blender but it didn’t work!! Ahh the smell is great and delicious but the bar is a mess and failed. Im using cocoa butter that comes already cut in round shapes. The recipe calls for 1 cup cocoa butter, melted or unmelted? How long can we keep this chocolate in the fridge? Hi!! Your recipe sounds amazing!!! Can’t wait to try it! I was wondering how long we can keep it before it expires… Do we have to eat it right away? I would like to add almonds, raisins and pistachios to the dark chocolate. If they are raw, how much time should I bake each of these in the oven? I’m so happy to find this recipe! I am making this for gifts for clients….maybe 40 people. Trying to figure out how much cocoa butter to order. How much does this actually make? I’m going to spread it on a baking sheet and break into squares. What size sheet did you use and what are the approximate dimensions of the resulting chocolate “slab?” Thank you and Happy Holidays. You saved my life with this recipe. Just order a small quantity. This makes a small baking sheet’s worth. Made this chocolate goodness yesterday my new favorite. I added craisins and used walnuts instead of almonds. Hello I’ve made this before but you my own healthy sweeteners mixed and powdered. it seems the sweetener never melted or something. The chocolate was grainy and when you chew it, it seems to have a crunch. Any ideas? It’s probably the powdered sweeteners. I’d stick with maple syrup if you can! I tried making chocolate like this but it’s always very starchy and dry, tastes ok but the textures not as good as chocolate from the shops. I may never buy chocolate again……..
Hey! Do you have to roast the nuts or can they be raw? They can be raw, I just prefer them roasted. I have some questions about this recipe. If I don’t have cocoa butter and coconut oil, what can I use? And, can I use honey instead of maple syrup? Hi Dana, do you think I can use cane syrup instead of maple? I have some homemade cane syrup in the pantry. I think so! Give it a try and let me know if it works! So easy and soooooo good! Loved this. But yeah, if you can find cocoa butter… just, wow. I’m confused about the cocoa butter. Should I be looking for food-grade cocoa butter? The link is to raw organic cocoa butter for the body? The one I linked to is food-grade! See the comments – lots of people used it to make desserts with. THIS IS AMAZING. I mean, I didn’t even know this was possible. Dana, you are a genius in an apron. I am SO EXCITED to make this. I have been making a lot of chocolate lately with a combination of cocoa butter and coconut oil. Sometimes I do all coconut oil. I’m excited to try it with all cocoa butter! When you use Coconut Oil – in whatever quantity – small or large – the chocolate must be kept in the fridge or frozen. Especially if you have a warm environment. If your home is cold – maybe it won’t melt. But coconut oil is liquid at 72 degrees – so keep it in the freezer and you won’t have an oily mess and things won’t separate! I hope this helps everyone. I have a great recipe for raw chocolate with the coconut oil I am posting next week on my blog. I love to include it for it’s health benefits and coconut flavor. Thx again Dana for a super exciting recipe and great photos. I will post a photo on Instagram for you after I make it! Please do! And thanks for the tips! So YUMMY! 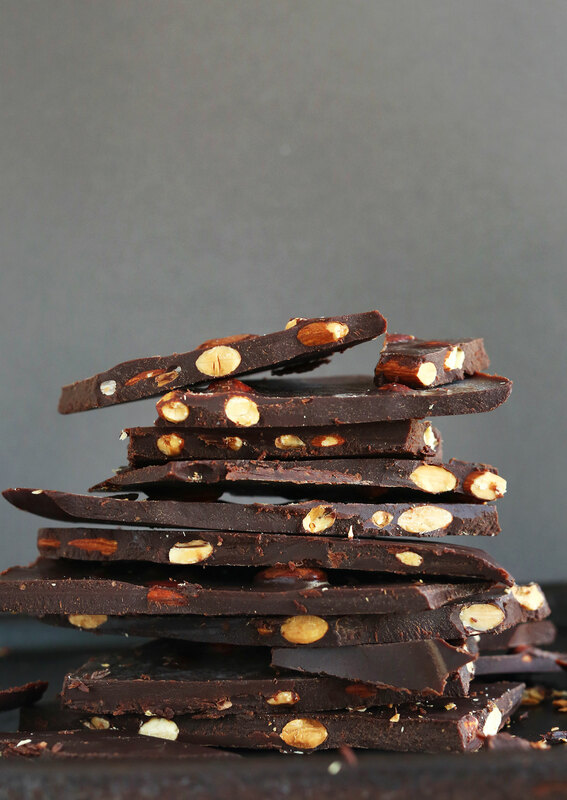 Dark chocolate and almonds are my kryptonite! I’m intrigued. Chocolate at home isn’t something I ever would have thought to attempt, but you’re selling me on it! Think of all the possibilities for toppings – yum! I know right? My mind is already spinning. Hope you love it, Jess! So nice to hear from you! Hi there! I have cacao nibs that I haven’t been able to find ANY use for so far, any chance I could use them as a sub for cacao butter in this recipe somehow? Or for the cocoa powder? It looks amazing! I think I could eat way too much of this. Hi Dana, I tried this recipe and don’t know what went wrong, but the maple syrup separated in the freezer and did not freeze. I did have to use coconut oil instead of cocoa butter, but followed your directions and it turned into a sloppy mess! The oil and cacao solidified, but the maple syrup stayed soupy on the bottom…still tasted good, though, just had to lean over the sink to eat a bite!? So odd! Sorry about that. I have no idea why that happened. Did you whisk it vigorously? I didn’t test it with 100% coconut oil, but rather a mix of coconut oil and cocoa butter and MUCH preferred the all cocoa butter chocolate. If you’re able to get your hands on some cocoa butter, I’d highly recommend it! Yumm!! I love making my own chocolate bars. Almonds are right up there with cashews as top favorites. Yours look so good!! You may want to ask the distributor about that. I’m not sure! It does take quite a bit of heat to melt it, so I’d be surprised if it wouldn’t survive the transit! This is awesome! So simple and easy to make, I alreadyhad all the ingredients in my pantry! I tried to make this earlier today and after I took it out of the freezer I tried to break it apart and the syrup was stuck to the bottom and still liquid and sticky. The chocolate had solidified just fine, though. Does that always happen? Do you have to leave it in the freezer longer? (I had it in there for about 30 mins though) Or does it happen while you’re mixing it? Does the heat from the melted coconut oil separate the two? Despite that, it still tastes great, though! I would say try and freeze it longer until completely firm. I’d also highly recommend trying it this recipe with the recommended cocoa butter, because the coconut oil imparted an oily texture and taste to me that wasn’t as pleasing on the palette. i have made this with half coconut oil and half cacao butter…..it worked great. i find that cacao butter sort of makes my stomach feel strange. i think it is an intense fat. the coconut oil seems to mellow it out. I️ love this recipe and receive a lot of compliments from friends and family. Recently someone asked me if I knew the cacao %, you wouldn’t happen to know the answer or how to figure it out. I imagine being a professional, real-life Willy Wonka would be pretty awesome… I’d eagerly be your patron!! ;) Sign me up for the next tour of the Minimalist Baker Chocolate Factory (or just to “taste test” chocolate delights like this one)! :P I seriously am a huge fan of your recipes, but your sweet treats especially blow my mind…so creative and delicious! This post has seriously triggered some chocolate cravings! 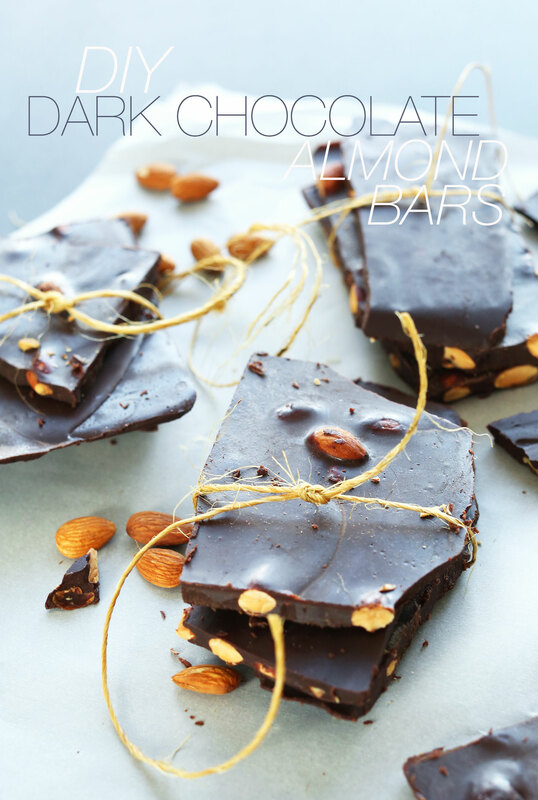 It just looks like perfection, dark chocolate and almonds, I’m sold! Oh, these bars look delicious! OBSESSED. Yessss Minimalist Baker never lets me down! A while ago I found cocoa butter in my local supermarket, got really excited, bought cute heart-shaped chocolate moulds and then promptly got too intimidated to try it. I’m definitely going to try your recipe! I wonder if i could get a dollop of date caramel in the middle of my little chocolate moulds? This looks and sounds divine. How irresistible would this be with coconut flakes sprinkled on top?! Chocolate is life, so you are definitely speaking my language. What a perfect dessert/treat! They look so delicious, and easy to make! Wow! This looks amazing!!! i can’t wait to make it! !